How do I get a floating license? I was excited to see read about the new floating license feature, as some of our teams don't need the full 250 users we purchased when testing, but do require the full functionality of an Enterprise license. 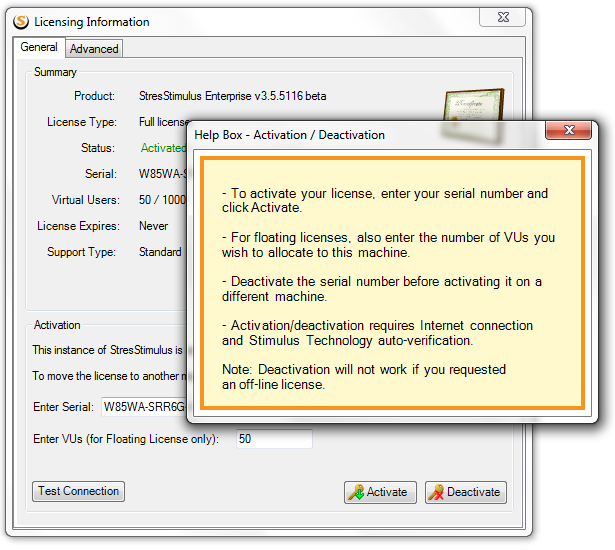 Is this floating license functionality included in the Enterprise license? How can I activate it? Floating licenses are designed to do just that. For example, if one of your teams needs 50 VUs for a particular test, their test machine should be activated with 50 VUs, as shown below. This will leave 200 VUs out of 250 licensed VUs available to other teams. To change the number of allocated VUs, enter a new number and click Activate again. Each team would be able to run their tests concurrently and will have the Enterprise/SP functionality. This will eliminate the need to purchase multiple licenses. Floating licenses will be a separate option that can be combined with selected edition, e.g. Enterprise. Pricing will be finalized and announced by the time of the 3.5 release. The cost ratio of floating / node-locked license will be in-line with the industry practice. Upgrades to the floating license will be available. Thanks, it does. As a note, my main usage of the feature (in addition to sometimes loaning users to other team members that, say, only need some users for a week) is that I would like to run a long-term, low-load test on one system the same time I am running shorter, peaked loads on a different system. Currently, the pro edition really doesn't provide the functionality I need for most of my tests, but getting another Enterprise license to run a 10-50 users test is not an option. Though the release announcement for 3.5 (http://community.stresstimulus.com/profiles/blogs/v3-5-announcing-release-what-s-new-pricing-and-promotions) states that the floating licenses are available, I do not see any information on the pricing or how to obtain a floating license. Where can I find this information? 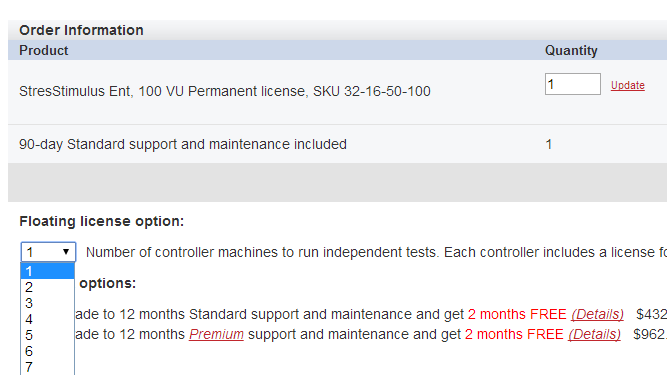 When you're on the order page, click inthe floating license option drop-down and select the number of concurrent computers on which you would like to run independent tests.